The new generation of restaurant owner is as discerning about their point of sale system as they are about their ingredients, and their customers are just as particular. Nothing goes through a restaurant or a kitchen without first going through the restaurant POS. For this reason, the technology that the restaurateur relies on must be solid and it has to be fast. When it comes to features, today’s restaurant owner wants to be able to split checks and split items, they want a topping matrix that can handle not only whole and half but quarters as well. They want upsize and downsize, and they want it to handle inventory accurately. They need dine in, takeout, curbside, takeaway, over the counter, table service, bar, nightclub, line busting, online ordering, and they want to track their VIPs with a guest list and reservation system. They want accounting interfaces, integrated credit & debt – wired, wireless, and cellular – and they want to sell gift cards, both physically and virtually on their website. They want inventory with recipes and ingredients, and liquor tracking, bottle counting, and draught metering interfaced to the POS. At the back end they want reporting in the restaurant and in the cloud, and they want to be able to get key metrics from their smartphone. They want to get automatic alerts when things go wrong in the restaurant, and they want to know when things go right. 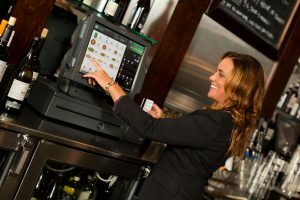 Smart restaurateurs trust Armagh POS Solutions to provide the right products and services to make all of these things possible. We provide 24/7 support with emergency onsite service when things go wrong, and we’ve been doing it since 1979, so we know a thing or two about restaurant.